OLD PARKED CARS. 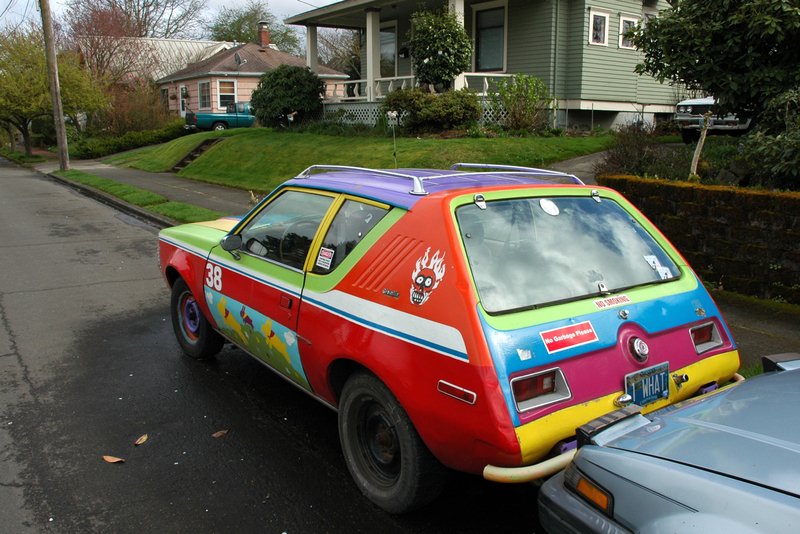 : 1975 AMC Gremlin. Recognize any OPCs in the background of this? WOW who ever put the color and those pardon my language " Crap " on that gremlin should me driving or owning vintage cars, i personally own a 1974 Gremlin X with 5L V8 and i saw this and i thought What could go through someones mind to to this? anyway Love the Page keep it up man!!! this spent last week at the transmission shop by my house, so you know somebody is paying to keep it running--in addition to taking superficial aesthetic liberties. without the novelty doo-dads, i would sincerely dig this paint scheme. my favorite detail is the single fender-mounted mirror on the passenger's side. That's a nice 3rd gen Accord right behind the Gremlin. Any chance for some piccies? I'm a die hard gremlin fan but I'm finding this one a little hard to look at. It literally looks like a clown car, and now I know why. 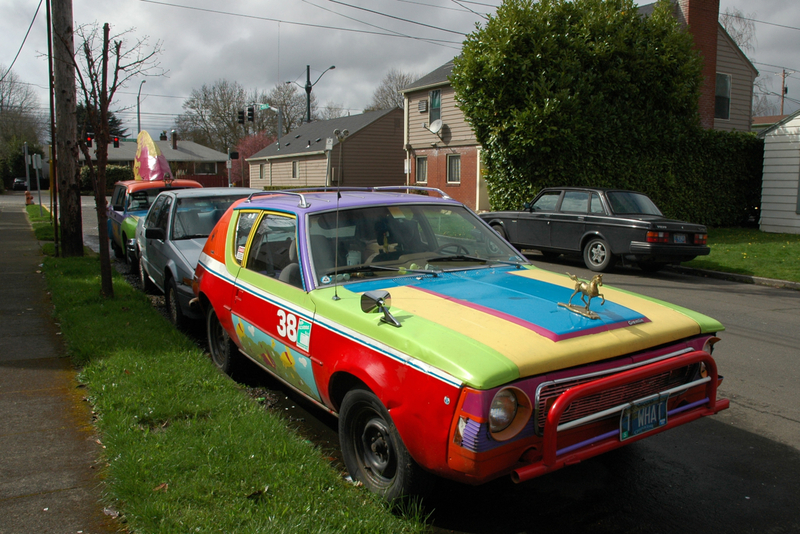 it's gotta be the same owner as the wacky Volvo wagon art car with the giant fin on top from last year, in fact you can see it parked right behind the Honda in the first pic. it makes so much sense now. One suspects a glorious man free household behind all this calculated hysteria. I find the license plate the real topper. At 0.43 on the video, the car parked on the right is a Nash Metropolitan. That Gremlin painted JUST that shade of red with slotmags.....perfect. 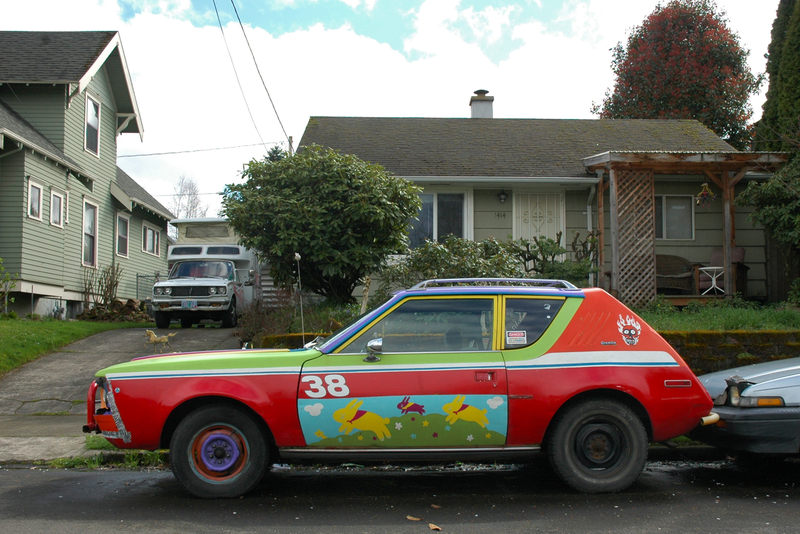 The owner of this car owns Beaterville Cafe on N. Killingsworth in Portland. Beaterville Cafe is all about, you guessed it...old beater cars. You have to see it yourself, as the whole restaurant has an old car motif and the food is very, very good! Actually, it's a Nash Statesman Airflow, not a Metropolitan. Seeing this car makes me wanna check the paint code and see what colour it originally was... I'm pretty sure it was blue though. Judging from the blue on the rear panel and the blue on the stripes.